The new show, called “Đa lat – A Miracle Night”, is run by the CNT Company and can accommodate up to 400 people. It will offer various forms of theatrical entertainment, such as drama, music, comedy and dance, as well as circus shows, every Saturday and Sunday night. It will be performed at the present location of April 3 Cinema, in Hoa Binh area, in downtown Đa Lạt. 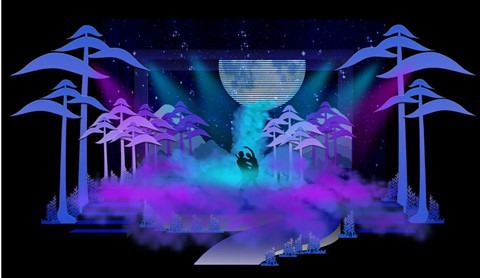 “The show will feature with 5D technology, which will allow audiences to use their senses of touch and smell,” Ly Tran, director of the project, said. The first performance will open on June 2. Đa Lạt, the capital of Lam Đong Province, is located 1,500m above sea level on the Langbian Plateau in the southern part of the Central Highlands region. First discovered by the French in the 19th century, the area has since been among the country’s most popular tourist destinations. Located at 289 Hai Ba Trung Street in HCM City’s District 3, Tan Đi nh Church has been a destination for Catholics as well as tourists who come to admire the imposing French-influenced architecture and find peace for their soul. Built by the French between 1870 and 1876, the church was built in a Gothic architectural style featuring Roman-style designs. 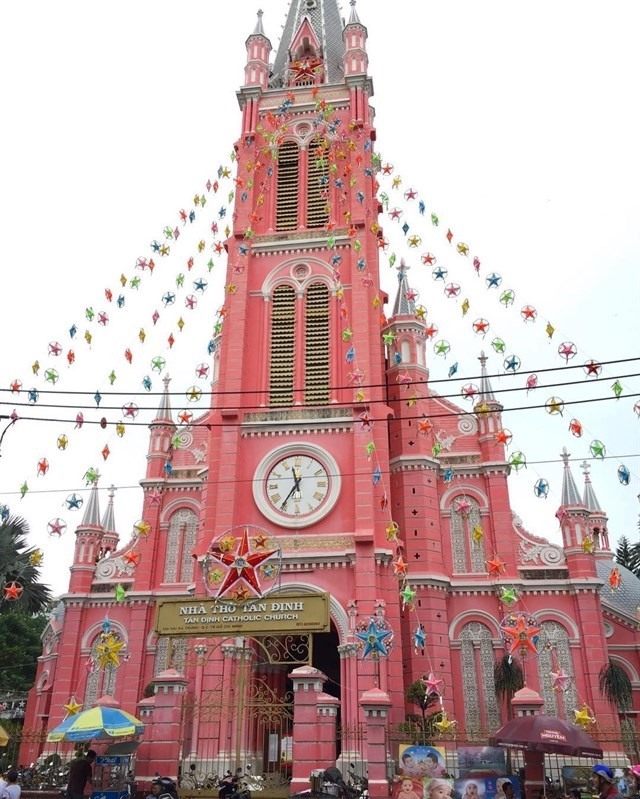 The church, better known as the Church of the Sacred Heart of Jesus, was painted with a vibrant pink colour on both the exterior and interior, drawing huge attention from passersby and those from abroad. Pom Coọng Village in Mai Chau District is a must-see for travelers to the northern province of Hoa Binh. 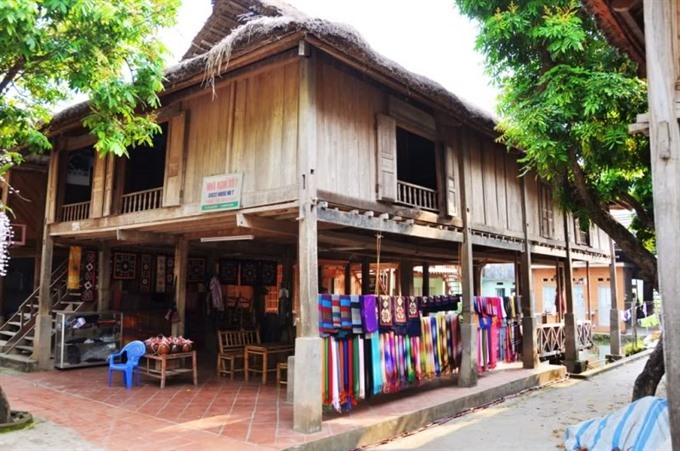 A village populated by the Thai ethnic minority, Pom Coọng in Mai Chau District is a must-see for travelers to the northern province of Hoa Binh.There are 70 stilt houses in the village. Many people here stick to their traditional vocation of making brocade while others help entertain tourists by performing traditional music or serving local specialties made from pork and chicken. Visitors to Pom Coọng can stay in the stilt houses and rent motorbikes to explore the region. Italy and Spain for another year, local media reported Friday. Passenger ships will soon be banned from staying overnight in Ha Long and Bai Tu Long bays, authorities in the northern province of Quang Ninh said. In the near future, only daytime travel will be allowed in the sea. The move is part of a local program that also intends to replace wooden boats with metal boats over the next five years. The authorities expected that the program will help enhance tourism service quality and safety. Currently, 553 tourist ships operate across the two bays, 202 of which dock overnight. In 2015, Ha Long and Bai Tu Long bays welcomed about 2.5 million tourists. The fleet can serve a maximum of 10 million passengers, meaning there are too many ships. Quang Ninh recently issued a temporary regulation that allows wooden ships to operate in the bays for a maximum of 15 years, as opposed to the regulated 25 years. 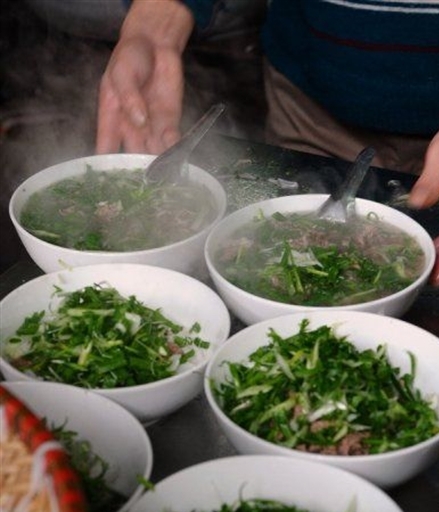 Steaming bowls: CNN has named Hà Nội’s phở as one of the top ten most delicious dishes in the world. bowls of pho. Hà Nguyễn learns that the broth is what makes or breaks a dish. 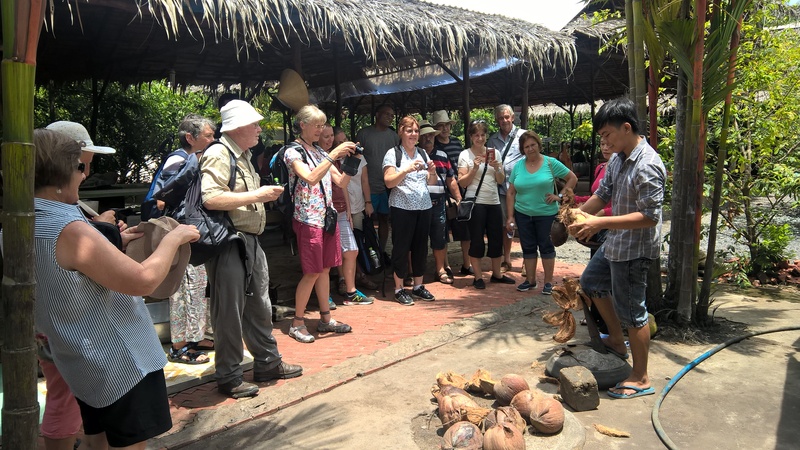 My friend Dương Quang Phong from Los Angeles arrived in Hà Nội for a trans-Việt Nam tour. He asked me to join him for phở, the most famous food inside and outside of the country. We decided to start our breakfast at 49 Bát Đàn, a bustling street in Hà Nội’s Old Quarter. As soon as we entered the street, we smelled the aromatic fragrance of phở from the shop, rousing our appetites. Although many years had passed by, the shop maintained its same shape, doors, old tables and tools – particularly a long queue of diners patiently waiting for their turn, said Phong. We joined the queue and heard curt words from the shop owner, Trịnh Văn Hiếu, loudly asking guests about their orders and whether they wanted more or less rice noodles, or thick or light broth. There was the familiar sound of a knife regularly chopping meat against a cutting board. Steam from big bowls of phởspiraled upward. When our turns came, I ordered phở tái bắp lăn (stir-fried beef muscle), while Phong ordered tái lăn (half done stir-fried beef). The shop owner skillfully cut the beef and put it into a bowl with sliced fresh onions before scooping broth on top. The shop is so crowded that we had to struggle to find a seat before joining the queue. After receiving our dishes, we returned to our seats in a corner of the shop. 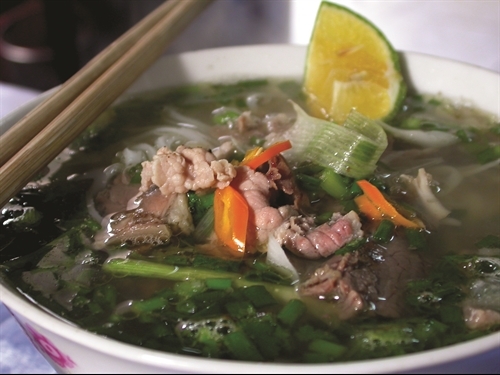 Phong said the quality of the broth has remained the same for 20 years, when he returned to Hà Nội the first time. Whether phở is tasty or not depends on the broth and rice noodle, and here, the combination was just right. Hiếu said he made the broth by simmering beef bone and organic spices such as ginger, cinnamon and sá sùng (sand worms) from the northwestern province of Yên Bái and the port city of Hải Phòng. We enjoyed the phở very much, although each bowl was rather expensive at VNĐ 50,000-70,000. Despite this, locals and foreigners continued patiently queuing for their turn to enjoy an aromatic and tasty phở. Phong told me that he would like to enjoy more phở at other famous shops such as Phở Thìn at 13 Lò Đúc Street and Phở at 10 Lý Quốc Sư Street. The next day we arrived at Phở Thìn early in the morning. We asked for two bowls of tái lăn for VNĐ50,000 each. We did not have to wait long because there were not so many diners compared with Bát Đàn. A server brought us two big bowls of phở, which was also full of rice noodles and stir-fried beef that was very fragrant. Although the servers were not so friendly, the service was quick and the quality of the food made us pleased. The dish is fragrant and tasty because of the broth, which is greasy and quite sweet, while the tái lăn is soft and sweet, too, mixed with ginger and garlic. This helps shop owner Nguyễn Trọng Thìn keep his trademark, which spread far and wide so that customers would never forget it. Thìn set up his shop nearly 40 years ago. From the onset, he tried phở at many other famous shops in the city and thought of special spices to create a unique recipe of his own. After a year, he decided to serve phở tái lăn, in which the beef is quickly stir-fried over a big fire in a large pan with fat in it. After that, the thin beef pieces are put into the pan and stirred quickly. Ginger and garlic are added to the pan before it is scooped into the bowl. 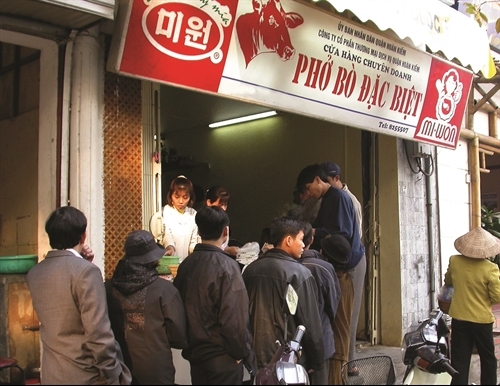 In 2009, after 30 years of business, Thìn was invited to Seoul to teach phở cooking techniques to a number of Koreans and Vietnamese working and living in South Korea who wished to open a phở shop there. A Korean general director of a large company told him he had never eaten such delicious food. He asked Thìn to sell his secret for making phở. Thìn agreed. After three months of training, several phở restaurants opened in Seoul, including Tặng Restaurant, a popular place for Vietnamese and foreigners alike to come and enjoy “phở Thìn”. The next day, we tasted phở at 10 Lý Quốc Sư Street. When we reached the shop, a crowd of locals and foreigners had already gathered. With prices between VNĐ40,000 and 50,000 per bowl, Phong said he could eat two bowls because the rice noodles seemed to be in smaller quantity compared with the other two shops, but the beef and broth were both excellent. Get in line: The phở at 10 Lý Quốc Sư Street always draws a crowd. This cheat sheet will help you navigate through the country’s complicated set of customs often practiced during the Tet Lunar New Year holiday. “Sức khỏe dồi dào” (Extremely good health) and “Tiền vô như nước” (Money coming in like water) are two of the most popular wishes shared among relatives and friends during the holiday. Practice the wishes and say them to everyone you meet with a big smile, in order to bring them good luck. To elders, there’s another wish, “Sống lâu trăm tuổi” (Live long until 100 years old). Just make sure that the wish recipient is not 99 years old already. If those are too hard, at least say the most basic greeting: “Chúc mừng năm mới” (Happy new year). 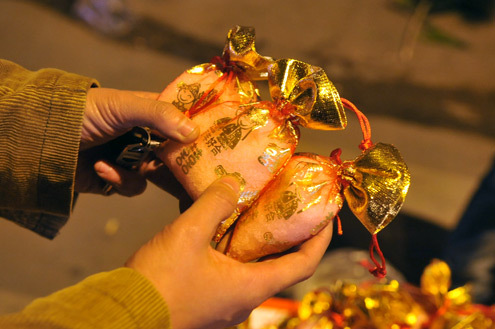 During Tet, children are given some lucky money. Therefore, prepare some red envelopes, of course with money inside, when you are invited to visit a Vietnamese family. More on this custom, please check out this particular guide to avoid any embarrassing moments. Tip: US$2 dollar bills are trendy in recent years, because of the scarcity of the note. 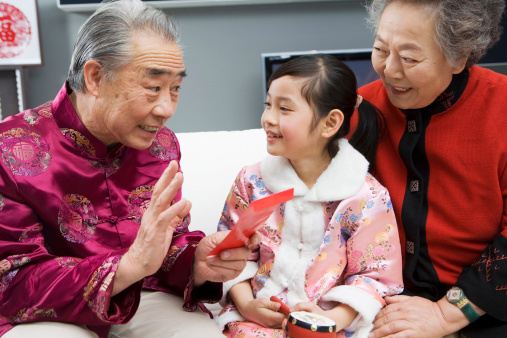 Giving kids lucky money is a long-lasting custom during Tet. Buying a small bag of salt is highly recommended in the New Year’s Day, based on the belief that you will have a “tasty” energetic year. Otherwise, you may face an insipid, boring year. Tip: Don’t buy too much because you may want to avoid a year that is “too salty”. So a small bag as a symbol will be enough. And, never bargain with salt sellers during the festival. Small bags of lucky salt for Tet. Certain fruits including custard apple, coconut, papaya and mango are recommended for Tet. Their names, when put together, sound very similar to a prayer for a fruitful year: “Cầu vừa đủ xài” (Wish for just enough to spend). Because only the most reasonable prayers, which ask for “just enough”, are answered by the gods. 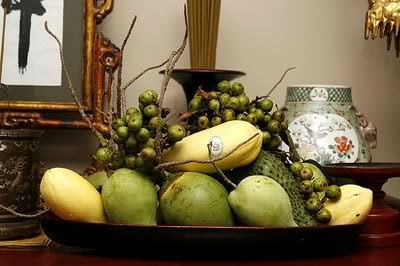 A tray of lucky fruits will include at least a custard apple, a coconut, a papaya, and a mango. Sweeping your house is a taboo on the first three days of the new year because all your money and success will be swept out too. So don’t touch the broom during those days. Tips: If you really need to clean up, just sweep your house from the front door into the kitchen, to bring money back inside. Otherwise, just use a vacuum cleaner. Modern life saves the day. 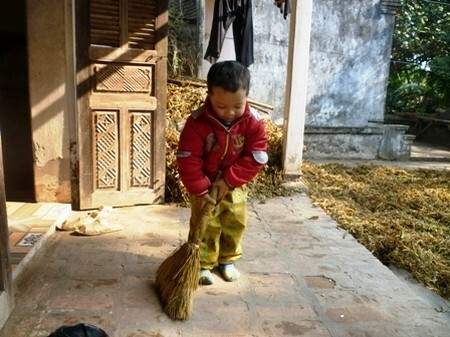 Don’t sweep your house during the first days of Tet. Refrain from swearing and using unlucky words. Bad words will haunt you for the whole year. Among the words in the blacklist are “die” and “sad”. Basically it’s just common sense. 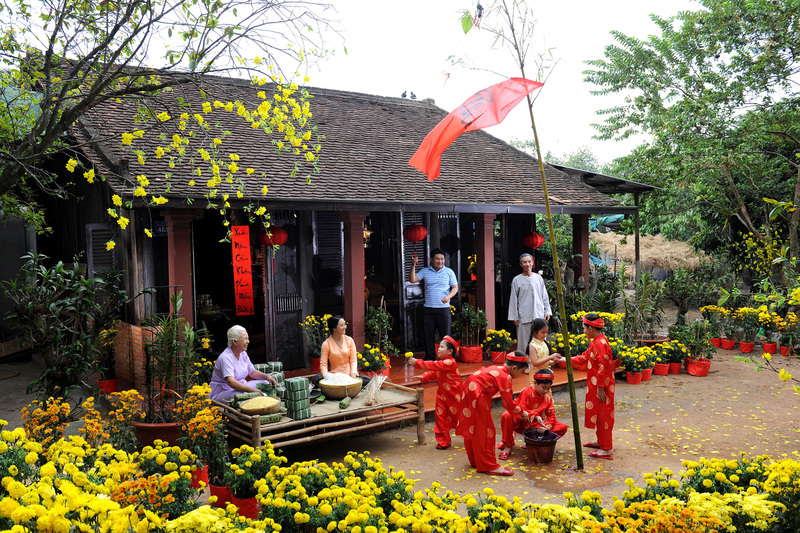 “Xông nhà”, or being the first guest visiting a family, is an important custom during Tet. Vietnamese believe that if a successful, charming guest enters their house, he or she will bring them good luck. Tip: Only going to public places is a safe choice. Nobody wants to be blamed for bringing bad luck. 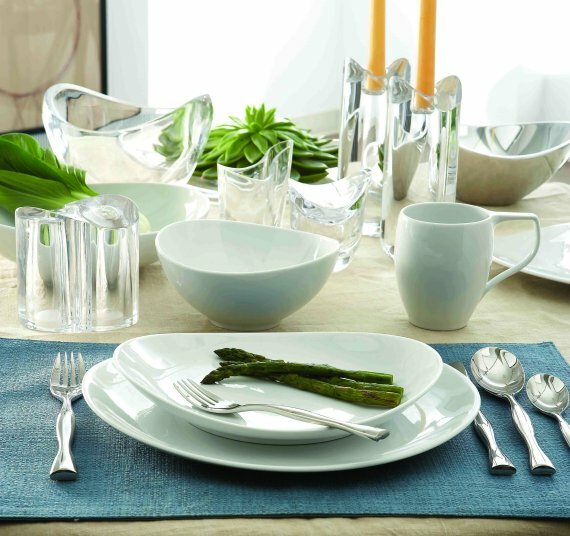 Unless you want to have a “broken” year, be careful with your dining ware. Tip: You may serve children with plastic plates and cups, to make sure everything is intact. 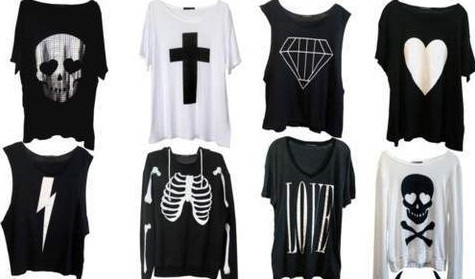 Since black and white clothes are often worn at funerals in Vietnam, people are supposed to avoid wearing these two colors on the first days of the year. Tip: If you really want to wear that white shirt you really like, just add some colorful accessories, such as a pair of red shoes or a yellow hand bag. These are stylish, but just leave them at home during Tet.